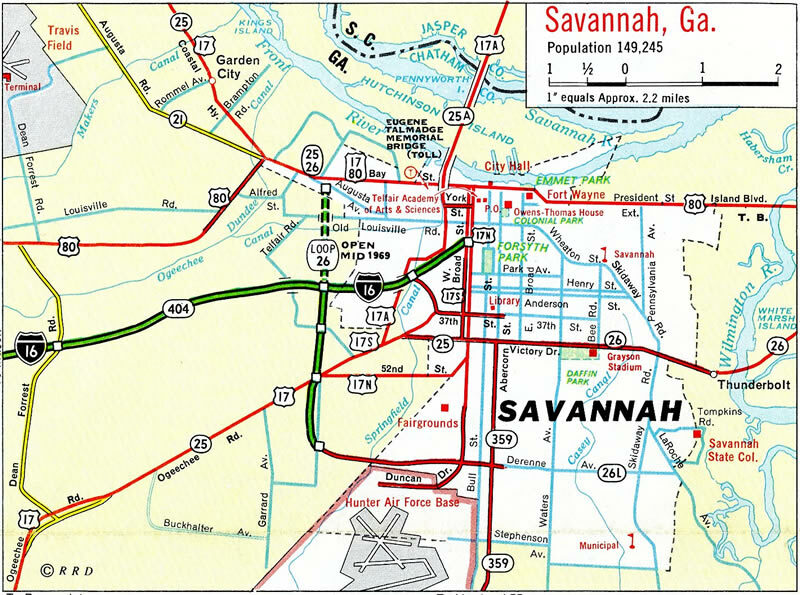 Interstate 516 forms an urban loop encircling the city of Savannah from the Hunter Army Airfield area north to Garden City. Known as W.F. Lynes Parkway, the freeway doubles as Georgia 21, unsigned Georgia 421, and portions of U.S. 17 and U.S. 80. The south end currently ends as DeRenne Avenue, a congested commercial boulevard leading east into Midtown Savannah. The north end serves the Port of Savannah via connections with Georgia 25. Project DeRenne addresses congestion issues east end of Interstate 516, where Lynes Parkway transitions to DeRenne Avenue at Montgomery Street. 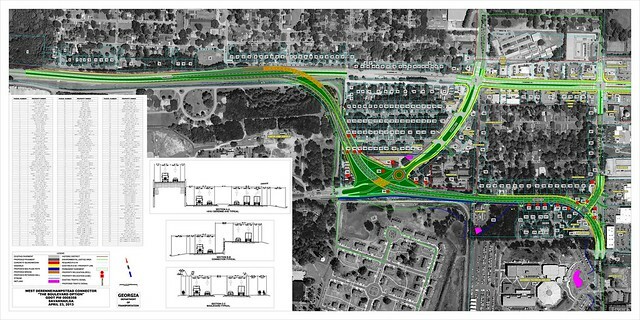 Initiated by the city of Savannah in 2008, and currently under environmental review (until 2016), the project involves extending the freeway end to a new interchange with Montgomery Street, expanding Hampstead Avenue east from there into a multi-lane boulevard, and reconfiguring DeRenne Avenue with access management, intersection improvements and new raised medians. Construction is estimated to start in 2019. Lynes Parkway was originally signed as Georgia Loop 26 (Georgia 26 is the state route designation for U.S. 80 through Savannah). Georgia 26 Loop was replaced with an extension of Georgia 21 south from Garden City to Savannah in 1979. Interstate designation for the route was approved by AASHTO on December 7, 1984. 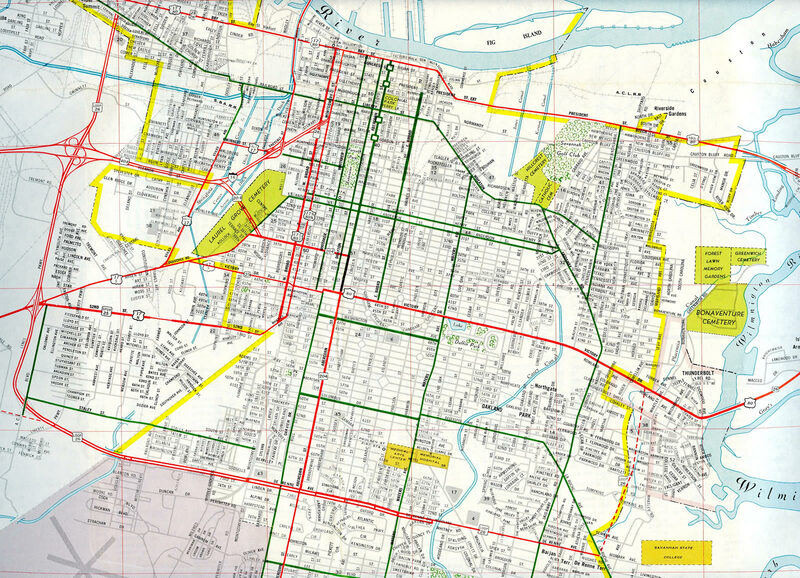 U.S. 17 and 80 then shifted from their shared alignment along Bay Street and the couplet of Broad / Montgomery Streets to overlap with Lynes Parkway in 1985. U.S. 17 was again realigned in 1988, leaving the alignment north from I-16 through Garden City and Port Wentworth to share pavement with I-16 east to the Talmadge Bridge. The 1999 Georgia Department of Transportation exit renumbering project gave Interstate 516 exit numbers for the first time. The Interstate is signed east-west, with exit numbers increasing from the southeast. Georgia Loop 26 (Lynes Parkway) spurred south from Interstate 16 to U.S. 17 &amp; GA 26 (Ogeechee Road) and DeRenne Avenue at ACL Boulevard in 1969. 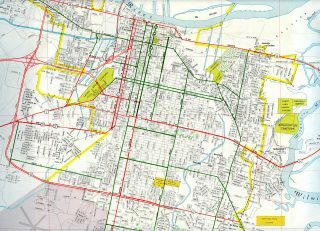 The original in-city route of U.S. 17 split the highway into north and southbound components along a combination of Ogeechee Road / Victory Drive / 52nd Street and the couplet of Broad and Montgomery Streets north to U.S. 80 on Bay Street. Georgia 26 Loop was envisioned as a full loop south of U.S. 80 in 1972. The route would take DeRenne Avenue east to La Roche Avenue and then follow a new alignment north back to U.S. 80 (Victory Drive) at Thunderbolt. A portion of this alignment was accomplished with construction of Truman Parkway. U.S. 17 ran west from Savannah due to the tolled Eugene Talmadge Bridge across the Savannah River. Tolls were dropped on the cantilever span in 1975, but U.S. 17 was not realigned over the former Alternate route until 1988. Interstate 516 eastbound reduces speed on the approach to Montgomery Street. A right-turn lane previously connected with Mildred Street south into an adjacent residential area. Photo taken by Chris Patriarca (06/11/03). W.F. Lynes Parkway transitions into DeRenne Avenue as I-516 ends at Montgomery Street. DeRenne Avenue extends Georgia 21 east 0.4 miles along a congested, six-lane commercial boulevard to Georgia 204 (Abercorn Street). Photo taken 01/03/14. For additional photos see Interstate 516 East & Georgia 21 South on AARoads. Georgia 21 (DeRenne Avenue) northbound intersects Montgomery Street and transitions to W.F. Lynes Parkway (Interstate 516) west. Montgomery Street arcs southwest from here to the Duncan Drive gate onto Hunter Army Airfield. Photo taken 09/22/14. The first westbound shield for Interstate 516 stands between Montgomery Street and the turn off to Mildred Street. Lynes Parkway fully upgrades to a freeway in 0.3 miles. Photo taken 09/22/14. Speed limits increase from 45 to 55 mph after the Mildred Street turn-off for the Tatemville neighborhood. Photo taken by Chris Patriarca (06/11/03). A second set of Interstate 516 & Georgia 21 shields are posted after Mildred Street. Lynes Parkway north advances 1.25 miles to Veterans Parkway (Exit 2). Photo taken 09/22/14. Georgia 25 branches northwest from Interstate 516 via Exit 8 (Georgia 26 Connector) to make the connection with Main Street, which it takes north from Georgia 21 to the Port of Savannah. Georgia 21 north meanwhile extends north as a busy arterial route (Augusta Road) seven miles to Interstate 95. Photo taken 01/03/14. Milepost seven of Georgia 21 north coincides with the west end shield for Interstate 516 within the parclo interchange at Burnsed Boulevard (Georgia 26 Connector). Photo taken 01/03/14. For additional photos see Interstate 516 West & Georgia 21 North on AARoads. Georgia 26 Connector (Burnsed Boulevard) comprises a short route linking Georgia 25 (Main Street), Interstate 516 & Georgia 21 (Lynes Parkway) and U.S. 80 & Georgia 26. 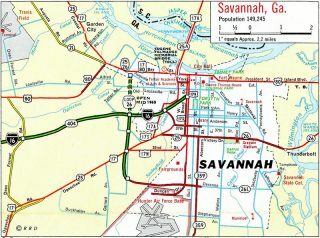 Traffic from the Port of Savannah turns south onto Burnsed Boulevard to access I-516 and GA 21 via a parclo interchange. Photo taken 11/13/06. Georgia 25 loops onto Interstate 516 east & Georgia 21 south from Burnsed Boulevard. U.S. 80 parallels the freeway from the end of Georgia 26 Connector to Augusta Avenue, where it accompanies Lynes Parkway south as well. Photo taken 11/13/06. Georgia 25 overlaps with I-516 & Georgia 21 south to Ogeechee Road, where it joins U.S. 17 for the remainder of its route south to Florida. I-516 leaves Garden City for Interstate 16, Hunter Army Air Field and Midtown Savannah. Photo taken 11/13/06. Georgia 21 (Augusta Road) changes over to Interstate 516 beyond the intersection with Oak Street. The freeway immediately splits with Exit 8 for Georgia 26 Connector and Georgia 25 (Burnsed Boulevard) north. Burnsed Boulevard connects I-516 with parallel Bay Street (U.S. 80), as it parallels Lynes Parkway east through Garden City. Photo taken 05/29/05. Georgia 25 south merges with Interstate 516 east and Georgia 21 south as the trio pass over Main Street and a Norfolk Southern Railroad. A loop ramp follows in 0.25 miles for Georgia 25 Connector (Bay Street) east. Georgia 25 Connector joins Interstate 516 with both Downtown Savannah and the Talmadge Bridge (U.S. 17 & Georgia 404 Spur) north to Hutchinson Island. Bay Street constitutes the former alignment of U.S. 80 east to President Street. Photo taken 05/29/05. The first Interstate 516 reassurance shield resides at the Lathrop Avenue under crossing ahead of the Exit 7 off-ramp. Photo taken 05/29/05. Georgia’s Official State Highway & Transportation Maps, GDOT web site. Page updated November 10, 2015.